Supersmile Toothpaste is the number one whitening system recommended by cosmetic dentists. It effectively whitens without risk of sensitivity and its scientifically proven formula removes plaque, strengthens enamel, fights cavities and supports overall oral health (view on Amazon). Brushing your teeth correctly with the right toothpaste is the first step to an effective oral hygiene regime. But with so many thousands of toothpaste available how do you know which is the right one for you? Obviously you expect a toothpaste to clean your teeth and help prevent tooth decay, gum disease, and bad breath. But all toothpastes tick these basic boxes. Consequently, many contain other ingredients or patented formulas to meet different needs. Many whitening toothpastes use abrasives and some can cause irreversible damage to the tooth enamel. But how do you know which ones are effective and safe, and which ones you should steer clear of? In the case of Supersmile, its patented formula aims to safely whiten while also cleaning, protecting, and strengthening teeth. Furthermore, Supersmile Toothpaste works on all tooth surfaces, including caps, crowns, and veneers. If you are thinking of turning to Supersmile Toothpaste then gentle teeth whitening is clearly a priority for you. In this review we provide some general guidance to help you make a decision and then tell you all you need to know to help you decide whether Supersmile Toothpaste is the right product for you. There are certain criteria which every toothpaste must meet. Combined with the right brushing action, a good toothpaste should clean and polish teeth and remove the plaque which causes cavities, gum disease and even tooth loss. It should contain an ingredient, usually fluoride, which makes teeth more more resistant to decay and promotes the remineralization that helps to repair early decay. In addition to this it should help to keep your breath fresh. Makes you want to use it? Variety of flavours, painless and effective whitening, also works on artificial tooth surfaces. Clinically proven to whiten teeth up to 4 shades over a 30 day period – 6 shades if used with Supersmile whitening accelerator. Works with artificial tooth surfaces. In summary, Supersmile Toothpaste safely and painlessly whitens and remineralizes teeth for fast results. It is is clincally proven to whiten teeth up to 4 shades over a 30 day period when used by itself – and up to 6 shades when used with Supersmile’s Whitening Accelerator. Supersmile Toothpaste supports overall oral health and is 75% less abrasive than the ADA upper limit. Unusually, it also restores veneers, caps, dentures, etc to their original shade. Supersmile is costly, though you can save money on the total system by buying Supersmile Toothpaste and Accelerator together. 1.) Does Supersmile toothpaste work? The specific goal of Supersmile Toothpaste is to remove stains effectively without sensitivity whilst at the same time supporting overall oral health (view details). Unusually, for a teeth whitening toothpaste, it also restores artificial tooth surfaces to their original shade. If you want to brighten your smile and have veneers, caps or crowns, or are worried about sensitivity or possible damage from harsh products, Supersmile Toothpaste is definitely worth considering. Teeth become discoloured with age and through the consumption of staining products like red wine, coffee and tobacco. A dazzling smile is therefore a sign of youth, vitality and happiness and something you want to be able to display without embarrassment. Supersmile Toothpaste contains a patented whitening formula called Calprox®. It works by gently dissolving the thin sticky layer of protein that forms on the tooth surface and attracts plaque, bacteria and stains. Studies have shown that Supersmile removed more of this protein film than any other product it has been tested against. So does it work? Yes it does. 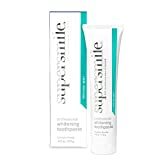 Supersmile Professional Whitening Toothpaste is clincally proven to whiten teeth up to 4 shades when used by itself and up to 6 shades when used with Supersmile’s Whitening Accelerator over a 30 day period. 2.) Will Supersmile toothpaste damage my teeth? No. Supersmile Toothpaste does not contain the harsh abrasive silica so it is much safer than other whitening toothpastes. Silica can gradually thin enamel which causes sensitivity, yellowing of the teeth and decay. By dissolving the sticky layer of protein that forms on tooth enamel, rather than scrubbing it away, Calprox® gently removes stains whilst other ingredients remineralize the enamel (view on Amazon). Its Relative Dentin Abrasivity is 75% lower than the ADA’s permissible limit. Everyone is different – age, medication, eating and drinking habits will all influence results. Some people may see results after just one brushing, for others it may take longer, but most people will see results in a few days if used as directed. As with all toothpastes the whitening process is a continuous one. However, you don’t have to change any of your existing habits; eat/drink as usual and regular brushing will continue to remove stains and whiten your smile. 5.) Does Supersmile toothpaste protect your teeth? Yes it does. Plaque and sugar produce acid in the mouth which can erode minerals in tooth enamel. This process is known as demineralization. If the minerals are not restored through remineralisation, tooth decay is the result. Supersmile has been clinically proven to inhibit plaque 10 times better than the leading plaque-removing toothpaste. The addition of calcium, phosphate and fluoride to Supersmile helps to restore protective minerals to tooth enamel, making the teeth more resilient to acid caused by plaque and sugar. 6.) How does Supersmile toothpaste taste? Regular Supermile has a minty taste, other flavours available are cinnamon and green apple. Supersmile is a great product if you are looking for a toothpaste that is effective, gentle and which works on artificial tooth surfaces. It is the number one recommended whitening toothpaste by Cosmetic Dentists. However, it is not cheap! If you are looking for this sort of product but want to pay less for it, try Sensodyne True White Toothpaste which provides subtle natural whitening for sensitive teeth. Supersmile Toothpaste and Supersmile Accelerator pack is available for purchase. This combination pack helps to elevate results and is great value for money (view details). Inactive Ingredients: Water, Sorbitol, Dicalcium Phosphate Dihydrate, Sodium Bicarbonate, Calcium Carbonate, Titanium Dioxide, Cellulose Gum, Calprox (Calcium Peroxide), Sodium Perborate, Flavor, Corn Starch, Magnesium Carbonate, Sodium Lauryl Sulfoacetate, Methyl Paraben, Sodium Saccharin, Propyl Paraben. Supersmile Toothpaste is the number one whitening toothpaste recommended by cosmetic dentists (view on Amazon). It is clinically proven to whiten teeth 4 shades after 30 days, and 6 shades when used with Supersmile’s Whitening Accelerator. Its proprietary formula, Calprox® does not exist in any other product. What differentiates Supersmile is different from other whitening toothpastes is that Calprox® dissolves, rather than scrubs, the sticky protein layer to which plaque, stains and bacteria adhere. It is 75% less abrasive than the ADA recommended allowance and also remineralizes teeth with calcium, magnesium, phosphates and fluoride to restore and strengthen enamel and fight cavities. It is a convenient and effective way to whiten teeth without sensitivity. Unlike most other whitening products, it also restores artificial dental surfaces to their original shade. Can I use this toothpaste on bonded teeth? Yes. Dr. Smigel who founded Supersmile invented the bonding technique. What flavour is best, I am sensitive to mint? Cinnamon and green apple are both great flavours if you are sensitive to mint. Can it be used on veneers? If used as directed a tube should last about 3 months. I get white spots on my teeth when I use whitestrips. Does this happen with the Supersmile system? No, Supersmile does not leave white blotches. It also whitens more evenly than whitening strips with no gradation – yellowing at the gum line to white..
Do I need to use it with the supersmile whitening accelerator ? The toothpaste alone will whiten teeth up to four shades over a 30 day period. Do I need to use it with the Supersmile whitening accelerator? How long will this toothpaste last if I use it twice a day? It is recommended you use a pearl-size drop of whitening toothpaste twice a day on a DRY toothbrush for two minutes. If you do this it should last approximately 3-months. Do you need to use the Supersmile toothbrush for effective cleaning?